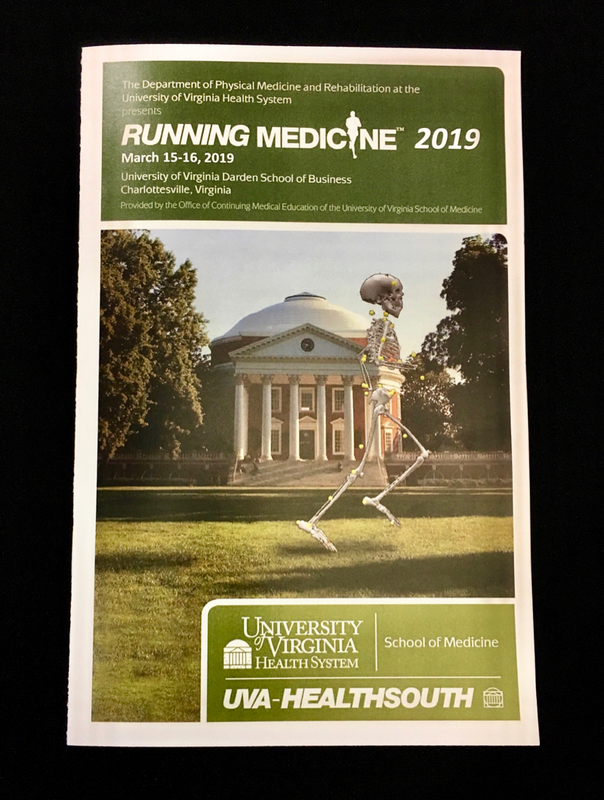 On Thursday and Saturday I attended the Running Medicine 2019 Conference at the University of Virginia Darden School of Business in Charlottesville, Virginia. My sister-in-law Eva works for the Office of Continuing Medical Education at UVA and is the program manager of the conference. I had just fulfilled my CEC needs at the Club Industry Show in Chicago when she first told me about the conference, so I asked her to put me on the email distribution list for future events. This year’s focus was on runners with anterior hip pain, pelvic floor dysfunction, and overtraining and fatigue syndrome; as well as treatment options for runners with hip and pelvis stress fractures and entrapment neuropathies (I wanted to volunteer my sciatic nerve for a live demo). We also learned about current recommendations for runners after total joint replacements, and perhaps my favorite lecture and lab talked about how upper body strength influences running performance. 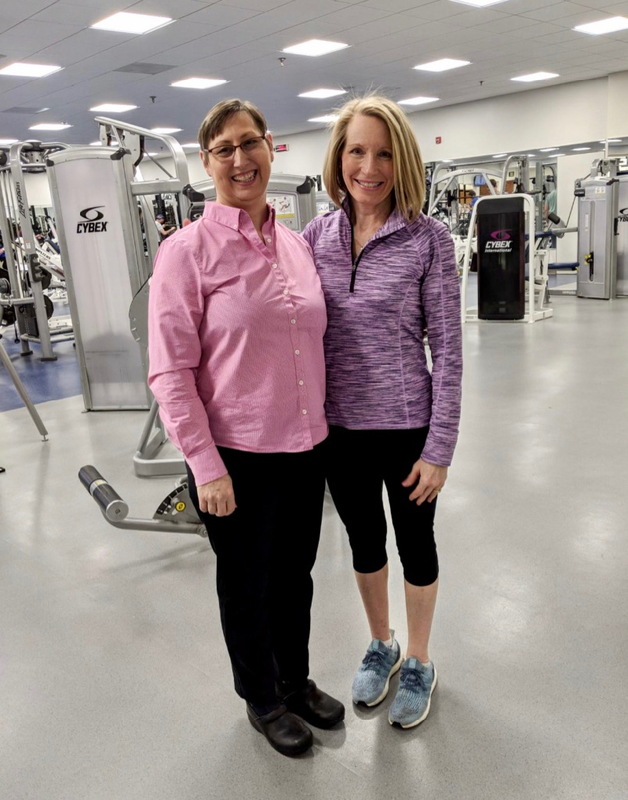 Prior to the conference, I was a tad nervous that the material would be a bit advanced for me since it’s geared toward physical therapists and athletic trainers, not personal trainers, but it wasn’t a problem at all and I learned so much! It was so nice to spend another weekend with Bill’s brother and wife – two weekends in a row of hanging out together. And even though it was a busy weekend, it was relaxing to get away and spend time with family again. Just Because He’s so Cute! I had two two-mile runs and one one-mile run this past week (all outside) and each one was a little faster than the previous, but still at reasonably easy paces as I rehab back to regular running. Two of my runs were at zero dark thirty, but one was in the warmth of the winter sunshine. Again , I front loaded my week with my workouts since I’d be traveling to the Running Medicine Conference later in the week. I squeezed in time two afternoons for 25-mile rides on my spin bike (affiliate link). During Saturday’s lab at the the Running Medicine Conference, we learned about 15 variations on upper body exercises that enhance running performance and I can’t wait to try them again this coming week. One of Saturday’s labs included focusing on pelvic floor activation during yoga. We imagined we were pulling in, holding, and shooting out a red kidney bean from different places in our pelvic floor; all while breathing properly and holding our poses correctly. It was certainly an interesting exercise and one that I’ll be sharing with a couple of my clients who I feel will benefit from the visual. 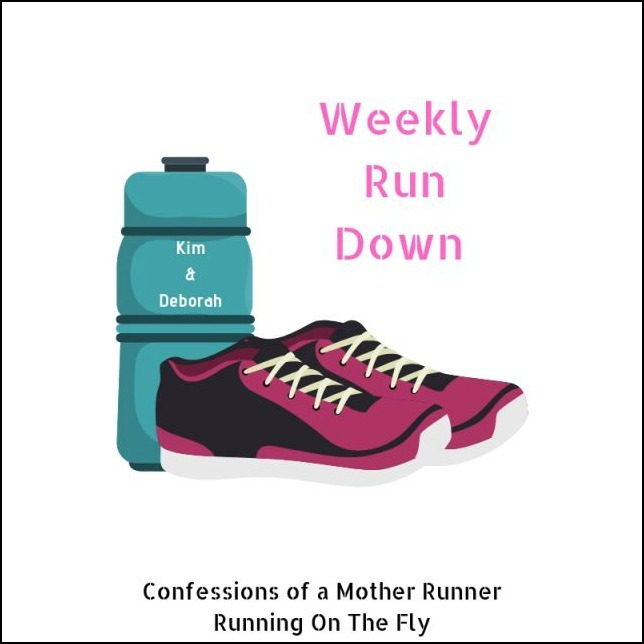 Sunday – Heading South to Warmer Weather and Where Did my Running Endurance Go? Does your job require that you take continuing education classes? Of those listed above, which lecture do you think you would benefit from most? 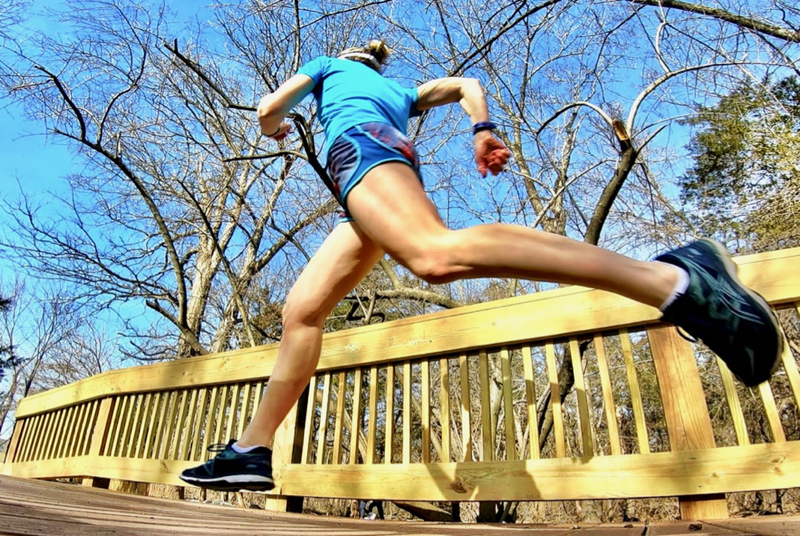 Heading South to Warmer Weather and Where Did my Running Endurance Go? I think overtraining & fatigue syndrome sound interesting! Upper Body influence on running would be interesting too. It would probably all go over my head, but glad it didn’t for you! Too bad about the foot numbness at home. 🙁 Boo. But a very cute cat! Those were two of my favorite lectures. “The Hip: One Surgeon’s Perspective” was really great, also. It was fascinating watching a labrum repair surgery, especially since one of my friends went through it a couple of years ago. Sounds like a great conference. Most lawyers do have CLE requirements, but MD and DC don’t require it. I would meet the requirement by all the lectures I give at CLE conferences anyway! Our super-warm weather didn’t last, but I hope our warm-ish weather does! Coco recently posted…Holiday, Rest Day, Snow Day — Oh My! I think I would really enjoy teaching similar classes for trainers. I love it when I give my “Staying Fit Through the Ages” presentation to seniors. I’d be really interested to hear about the upper-body exercises that benefit running. I prefer upper-body much more than lower-body (less chance of DOMS hindering my running LOL). Glad your runs are going well! Thanks for joining us on the link-up!! The upper body exercises lecture and lab were my favorites, too! The sunshine and shorts looks awesome! Glad you are getting some running in. Upper Body workouts that help running? Definitely interesting! That conference sounds so interesting! I would love to have been able to hear some of that info. What was the most interesting thing you learned? My favorites were the upper body workouts to enhance running mechanics (both the lecture and the lab). I enjoyed them all, but that stood out as my favorite. I also thoroughly enjoyed the overtraining lecture and the surgeon’s lecture. 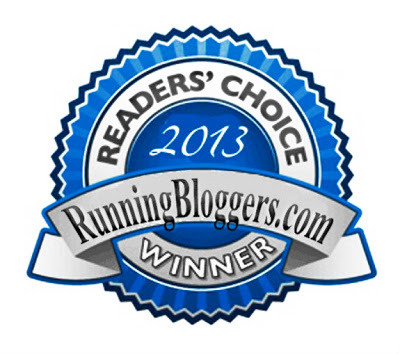 I would love to hear more about those upper body exercises that will improve running! I need CPDUs for my teaching license. Luckily, I get almost all of the hours either in meetings held during school. I have never had to pay for a class/course in order to fulfill those hours. That’s great that you don’t have to pay for your CPDU’s! Since I own my own business, I do have to pay for mine (I often got them for free when I worked for a large corporate gym). I went to Chicago a couple of years ago for Club Industry. That was so fun and I learned so much there as well! 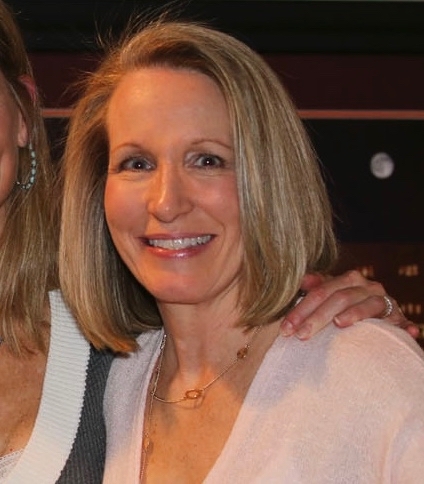 I am SO intrigued about what you learned regarding overtraining and pelvic floor dysfunction. I would love to hear more! Coaching and teaching both require CEs, but luckily I can get them pretty frequently. It was such an informative conference. 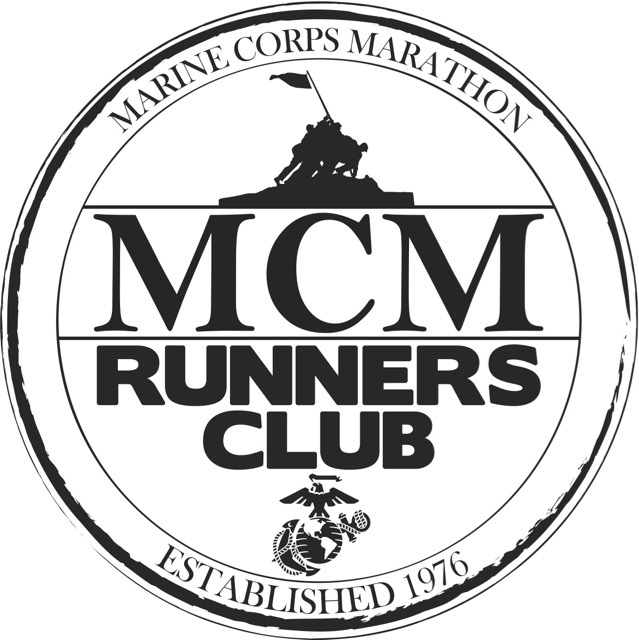 I can’t wait to see what aspects of running next year’s conference covers! What an interesting conference. Sounds like your runs are progressing. Good for you! Sounds like it was a really great conference full of valuable information! Glad to hear that your running is going well too! OMG I’m laughing at the image of “shooting out a red kidney bean from various places in our pelvic floor!” That is too funny. Looks like you learned A LOT – how cool for you! I would have loved to have attended something like that in my personal training days. So glad you had a great weekend and, I’m not a cat person but that one is adorable!! It was a great conference and one of my favorites (obviously the topics were right up my ally). Did you ever attend IRHSA, IDEA, or Club Industry when you were a trainer? Those lectures sound like they were super interesting. IT would be cool to have you write a little bit more about them here. 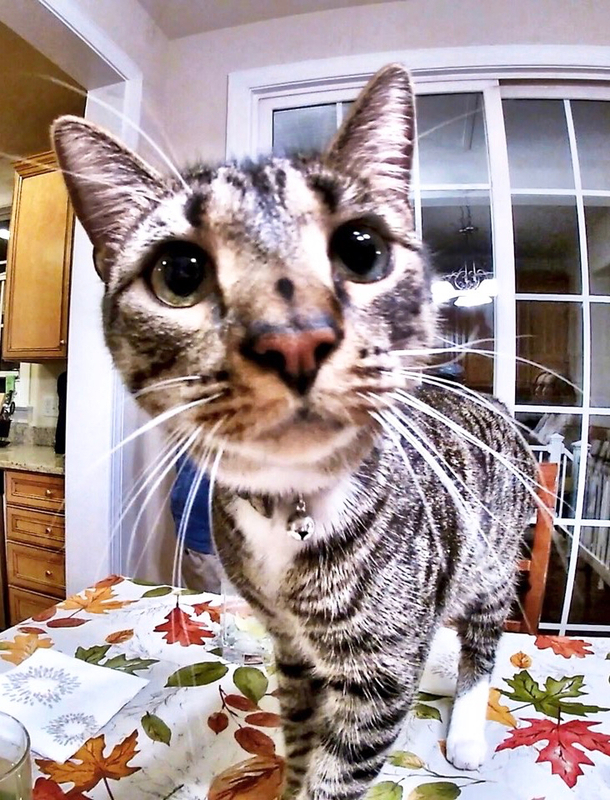 Love the cute kitty cat! the conference sounds REALLY interesting! My regular salary-paying job doesn’t require any continuing eduction but it helps to be interested in learning anything up and coming in banking and financial markets (which for most is a snooze fest). My other job, which I’m currently not doing, is sports massage and when I have the money for it I try to do workshops or courses that can enhance my knowledge. So I currently I do have certifications in a few other areas than just your basic sports massage. Anyway. I think anything related to the pelvic-floor or hip disfunction would be up my alley as well as overtraining and fatigue. I have seen a lot of clients who only run and they don’t realise how you can set your whole body out whack when you do that. Glad you were able to get out too – looks like the weather was pretty cooperative! I did race this weekend! Possibly my last one for a while. Still haven’t decided what to do this coming weekend. The conference was fantastic! I’m definitely lucky that the conferences I attend are running or fitness related and so interesting to me.